No admission fees for undergraduate veterans or dependents. 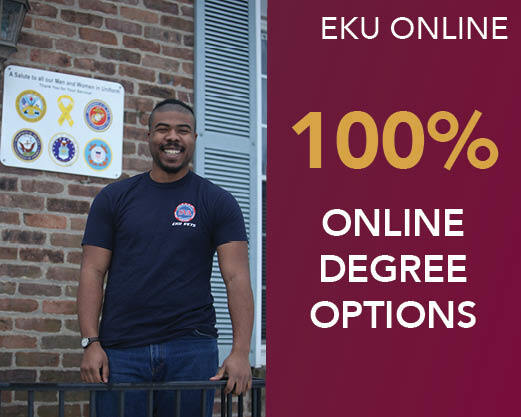 For the past six years, EKU has been ranked in the top 10% of Best for Vets: Colleges in the nation by Military Times, and has been ranked as a top Military-Friendly university by GI Jobs Magazine. The Office of Military and Veterans Affairs is your Reception Station at EKU. We are committed to your student success. Make us your first stop on campus, and come see us at the Burnam House at 317 Lancaster Avenue, next door to Irvine McDowell Park. Questions? Fill out the Information Request Form for a quick email response, or contact the MVA Office at EKU at 859-622-2345. ***GI Bill® is a registered trademark of the U.S. Department of Veterans Affairs (VA). More information about education benefits offered by VA is available at the official U.S. government Web site at http://www.vets.gov.